CBSE board examinations play a crucial role in deciding the career prospects of every student. Whether you are in 10th standard or 12th, whether you are a Science, Engineering or a Commerce student; your career will largely depend upon your board marks apart from the entrances of colleges. CBSE board examinations play a crucial role in deciding the career prospects of every student. Whether you are in 10th standard or 12th, whether you are a Science, Engineering or a Commerce student; your career will largely depend upon your board marks apart from the entrances of colleges. It is therefore absolutely imperative that the students prepare a proper plan and study the CBSE syllabus with right approach and technique. Often the students are so anxious while preparing for their board exams that they tend to commit a lot of silly mistakes that eventually bring down the overall percentage. 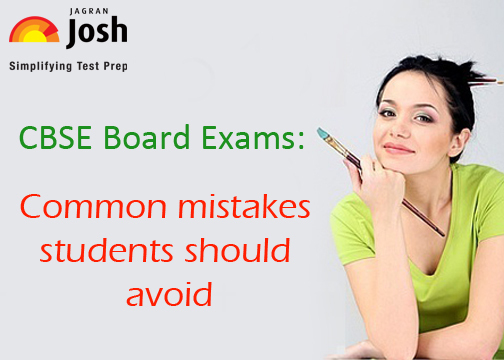 What are these common mistakes that the students should avoid while preparing for CBSE Board Exams? Let us find out here. One of the most common mistakes that student commit is studying continuously for 5-6 hours. Often the students think that this will enhance their stamina of concentrating, but this is totally false. In fact, exact opposite of this happens. With continuous studying, the mind shuts down after a while and eventually, nothing enters there. Whatever you study will not remain in mind for long and will vanish immediately. Therefore, it is very important to take a few breaks. Plan your study time for a total of 8-12 hours daily, but with considerable power gaps in between. Another mistake that students make during preparation of CBSE board exams is this one. Some of the students have around 20-30 minutes break in between, but even during this time, they tend to revise their syllabus in mind or only think about the board exams. This scenario is totally wrong and should be avoided completely. During your breaks, you should actually keep your mind off studies so that it gets the necessary refreshment. During your breaks, you can either go for power naps or park walks or simply chatting with your friends or parents. Often intelligent students lag behind in board simply because they do not have enough writing practice. Remember, the board question papers, at times can be really lengthy. You will always regret leaving those questions which you knew by heart, if at all, you face time crunch during exams. Therefore, writing practice is a must. Take a lot of mock exams and practice everything in written. Students often plan their study schedule at night because they think that there is no disturbance at this time. This is a wrong strategy. Studying continuously during night will leave you sleep deprived. This will start causing an adverse effect on your health and will eventually only increase the preparation time. So it is very important to take a proper night sleep, eat healthy and have a balanced exercise regime as well. This will keep your mind and body refreshed and ready for preparation and exam practice. One of the most common mistakes committed by students during exam preparation is leaving a few points of things for the last minute. Students think that they will revise a few important notes just before entering the exam hall, as this will reinforce things in their mind. But this is a wrong perception. Last minute mugging will lead to a lot of anxiety while sitting in the exam hall. You will commit those mistakes which could have been avoided, simply because you are nervous. Finally, apart from the aforementioned mistakes, it is important that you replace the process of self criticism with the idea of self correction. Do not be harsh while judging yourself. Give yourself ample time and prepare for your exams well in advance with the right study technique and approach. # Tips to do excellent in CBSE Board Exam.